A 21-metre yacht that was intended to race in the Sydney to Hobart is "under arrest" and welded to the dock at Rushcutters Bay marina, after the Polish sailing crew who had chartered it launched legal proceedings against its owner in the Federal Court. The crew from Yacht Club Sopot, in northern Poland, had its race dream dashed just days out from the annual Boxing Day race, when it learned the yacht it had chartered was not fit to sail because the vessel's supposed insurance policy did not exist. 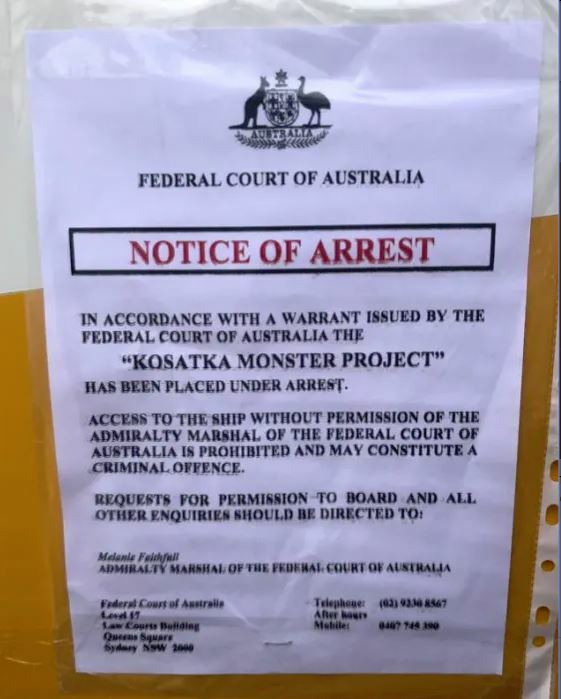 On Wednesday, the Kosatka Monster Project was scheduled to set off as one of 86 yachts in the Sydney to Hobart, a race it describes on its website as "hard to resist," with "an allure that sailors dream of." Instead the yacht is welded to the dock at the eastern suburbs marina, where it is under arrest and bearing a Federal Court notice, stating that "access to the ship without permission of the Admiralty Marshal of the Federal Court of Australia is prohibited and may constitute a criminal offence." 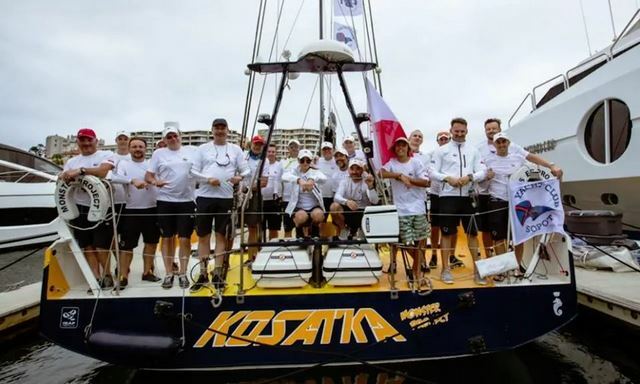 Monster Project had been chartered by Yacht Club Sopot, with 22 crew members having flown to Sydney from Poland and the US for the big race. However last Friday the crew was informed by race organisers Cruising Yacht Club of Australia that its chartered vessel had been rejected because it "could not meet its paperwork requirements." By Saturday the yacht was under arrest, meaning it cannot be sailed, following urgent Federal Court action launched by Yacht Club Sopot to recoup losses of $315,000 from the yacht's owner EcoNautics Racing Intl Ltd (ECNR), based in the British Virgin Islands. Yacht Club Sopto's claim relates to ECNR's failure to maintain proper insurances for the yacht, to allow it to compete in the race. It is understood the Sopot crew had received an insurance policy certificate from Roman Guerra, a Melbourne-based representative of ECNR. The certificate was said to be issued by Pantanaeus Maritime Insurance Australia. But after the Polish crew were notified by the CYCA of problems with their paperwork, a call to the Pantanaeus revealed no such policy existed. Representatives from Yacht Club Sopot also attended a police station in Sydney's east, where officers called the insurer, as a third party, and confirmed that the policy certificate was not valid. A fraud report was also formally lodged with police. Roman Guerra has been contacted for comment. In a statement to the Herald, a spokesman for Yacht Club Sopto said the crew was "incredibly disappointed." "All 22 sailors have come to Australia during the Christmas break to participate in the race. We are obviously all keen sailors and made sacrifices to take part in this race." He said the club had previously used the yacht provider in other races around the world and understood Monster Project to be "reputable," adding that the crew was very surprised this had happened. "We have arrested the vessel to hold it as security for losses we have suffered as a result of being barred from the race," the spokesman said. Under the Admiralty Act, which governs maritime law, a vessel can be taken under arrest as security for money claimed from the vessel owner and operator, who has 21 days to join the proceedings or the plaintiff can take the yacht. The first Sydney to Hobart yacht race took place in 1945, when friends in nine boats decided to race from Sydney to Hobart. Then, Wayfarer took 11 days, six hours to complete the race. Last year, LDV Comanche set a new race record, winning in one day, nine hours, 15 minutes and 24 seconds.